Continuing the EiC upheaval period, the August bullpen hints at "big news next ish about Gerry Conway and Marv Wolfman". 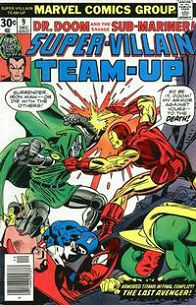 However, the September issue just says that Marv Wolfman is stepping down but doesn't say who his replacement will be. The October bullpen announces that Archie Goodwin will be taking over, and mentions Gerry Conway as someone who held the position after Wolfman! The October issue of the Fantastic Four (#175) mentions that Roy Thomas was going to take over the EiC role again when Marv left, but then Roy decided to move to California. The July bullpen mentions that Chris Claremont is stepping out of an editorial capacity and is being replaced by two new hires: Jim Shooter and Roger Stern. Ralph Macchio, a long time letter writer to Marvel, is announced in the October bullpen as a new hire, taking over Goodwin's responsibilities managing the B&W Magazine line. Marvel also wins a lot of awards in Britain's "first annual, nationally organized awards polls" for Howard the Duck, Conan, Captain Britain, and the X-Men. 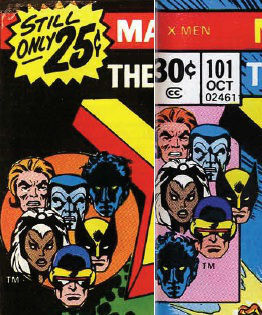 The price of comics rises to 30 cents (after several months of advertising "Still only" 25 cents). Inflation especially in printing, engraving, and paper costs, is blamed. Marvel claims to have held out longer than their competition in raising prices. The June issue Bullpens has a note explaining what those strange new UPC boxes in the corner of the comic covers are for. 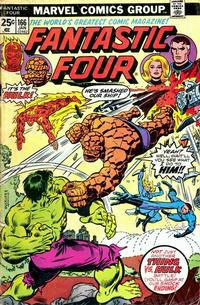 The July bullpen indicates that Marvel's subscriptions departments have started mailing issues flat instead of folded. And it puts up clarified rules for No-Prizes, saying that they will only be available to readers who spot major mistakes. Creator notes: The lack of consistent management reflects on the quality of Marvel's output, with X-Men, Master of Kung Fu, and the Defenders balancing out a lot of mediocrity. 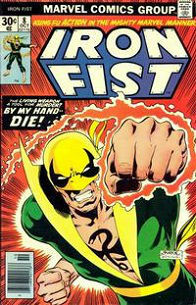 The Claremont / Byrne Iron Fist is also above average. George Perez is getting more work, but unfortunately his writing partners don't match his performance for the most part. Jack Kirby returns to mainstream Marvel with Captain America, but it isn't very good. His failed Eternals epic also begins this year. Introduction of the Eternals, Deviants, and Celestials. The more well known characters include: Ikaris, Sersi, Thena, Makkari, Gilgamesh, and Kro.